Austrian Dominic Thiem faces arguably the biggest challenge in sport, overcoming Rafael Nadal on the Court Philippe Chatrier clay, if he is to join the Grand Slam winners' club on Sunday. Only two players have managed to beat Nadal at the French Open since he first bounded into Roland Garros in 2005 armed with a bulging left bicep, pirate pants and a pulverizing brand of claycourt tennis the like of which had not been seen before. Thirteen years on and his record next to the Bois de Boulogne stands at an incredible 85 wins and two losses. An 86th win on Sunday will give the 32-year-old Spaniard an 11th French Open title -- a joint record for triumphs at a single Grand Slam along with Margaret Court who won 11 Australian Open trophies, albeit not all in the professional era. It looks a daunting mission for the 24-year-old Thiem but not necessarily an impossible one. He is the only player to beat Nadal on clay in the past two years -- in Rome last year and in Madrid last month -- and this season no other player, not even the undisputed claycourt king, can count as many match wins on the red dirt. True, he was obliterated by Nadal in the semi-final 12 months ago but Thiem has added more aggression to his natural claycourt weapons, specifically the forehand, as he displayed when stunning Nadal in the Madrid quarter-final. That win, according to three-times former champion Mats Wilander, should be all Thiem is thinking about when he prepares for Sunday's clash. "Forget the 10 (French Open titles) and forget what happened last year, Thiem has to remember what happened in Madrid which is a title Nadal wants to win almost as much as the French," Wilander, Eurosport's chief analyst, told Reuters. 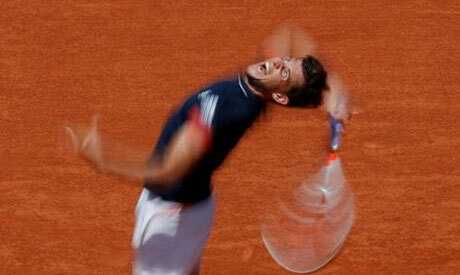 Wilander believes Thiem can worry Nadal if he is prepared to "take risks" like Diego Schwartzman did in the quarter-finals when he snapped the left-hander's run of 37 consecutive completed sets won at the French Open by snatching the opener. If not, it will be Goodnight Vienna for the man with one of the best single-handed backhands in tennis. "The only way to beat Rafa on clay is to take risks... to over-achieve you have to over-play and risk more than you feel comfortable doing," Wilander said. "If Thiem can do that and build enough hope in the first hour, hour and a half, maybe get the first set he can make it physical like he did in Madrid. I'm not sure if Thiem and Rafa had a run in the Bois de Boulogne that Rafa would win. "Thiem is an animal physically and in terms of hitting the ball hard on the forehand." Plenty have gone in with sound tactical plans against the 16-times Grand Slam champion in Paris but when the forehand bombardment begins, the best-laid plans usually fall apart as was the case in Friday's semi-final when Nadal thrashed Juan Martin del Potro who many thought posed a credible threat. "Rafa is a genius on clay, so far ahead tactically," Wilander said. "It's like he has a built-in coach in his mind. You can't tell what he's going to do before he does it, but when he does it, it all looks so obvious!" Thiem is looking to become only the second Austrian player -- man or woman -- to win a Grand Slam title after Thomas Muster's French Open victory in 1995.